The egg-shaped Isetta can be said to be the very best microcar of its time. Certainly it is the archetypal "bubble car", and is today recognized and loved worldwide. The cars origins were in Milan, Italy at the scooter and refrigerator company of Iso SpA, run by Renzo Rivolta. 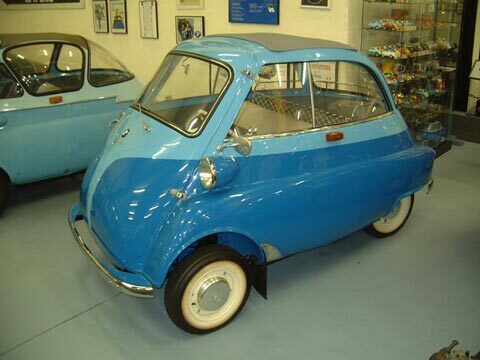 Called Isetta, or "little Iso", the car was a startling, totally unconventional design that caused a furor at its introduction in Turin in November 1953. From this influential debut grew a number of licensed branches worldwide, the main one being BMW in Germany. It was seen by BMW as filling a gap between their motorcycle range and the luxury 501 models. The car was redesigned to take the 250cc 4-stroke engine from the R-25 motorcycle, and the front suspension was changed. The finished car was announced in April 1955 and went into production shortly after. The quirky little Motocoupe as it was called by BMW, became the dream of the workingman, and by November 1955, ten thousand had been built. In February 1956, came a 300cc motor. In September of that year the redesigned "sliding-window" model made its debut, looking altogether more harmonious. 22,543 examples of the "egg" rolled off the line in this, its biggest year ever. This particular car is an example of the classic German-spec export Isetta, featuring a two-tone in the factory colours of Azure and Bavarian blue. 1957 was the only year in which the colour division on the door had the vee-shape. Several accessories are included in the specification. Weight: 770 lbs Electrics: 12 v 4 Wheels: 4.80 x 10"